An exciting new 256-color sonar performer with temp at a great low price! This unit packs a lot into a small package - 320x240 resolution, FishReveal™, HyperScroll™, ASP™, COLORLINE®, and more! Package includes X67C, transducer with temp., power cable. 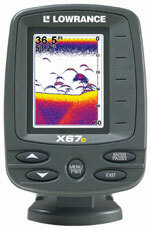 To order the Lowrance X67C, add to cart.